Hey, we get it – nobody wants to fail. But the hard truth is that failure is a fact of life. We try, get knocked down, and pick ourselves up to try again. We hold the ‘dust yourself off and get back on the horse’ ethos as admirable. We teach it to our children, and encourage them to learn from their mistakes. And we try to do this ourselves, as well. Here in Silicon Valley, failure is the foundation upon which many successes are built. Consider ‘Game Neverending’ – the failed online role-playing game that became Flickr. Or the check-in app ‘Burbn,’ which pivoted to become Instagram. Or ‘Tote’ – which repositioned and refocused to become Pinterest. In this part of the world, the greatest failure is failure to launch. Yet in business overall, failure is often treated as something to hide, ignore or – at best – quickly move past. The more visible or impactful the failure is, the greater the chance that those involved – often leaders or managers – engage in fault-finding rather than fact-finding. This is a huge mistake. Because the ability to embrace and learn from (inevitable) failure can be a game-changer when it comes to achieving success. Consider the field of engineering, for example; they study how and why failures occur to learn how to build stronger, safer structures. In this and other fields such as manufacturing and electronics, this is done through Failure Analysis – a formal process for determining the causes of failure, to prevent it from happening in the future. This is an important concept for those of you in the business of customer experience – because the ability to embrace and learn from failure is particularly important. Not only is customer experience improvement based on a deep understanding of where interactions with customers fail to meet expectations, the ability to drive customer experience innovation can thrive only in an environment where ‘fear of failure’ isn’t part of the organizational culture. Customer experience leaders know how put those failures to work. They obviously don’t celebrate (or tolerate) failure, but neither is it ignored or used to assign blame. These leaders embrace not failure, but what they can learn from it. Unsurprisingly, it turns out that those leaders who succeed with failure across different businesses and industries share a number of common traits. These traits make up a common-sense framework that you can learn from and follow, too. Over the last several years, I’ve had the pleasure of working with Mark Coopersmith to help bring the San Francisco Bay Area/Silicon Valley vision of innovation and entrepreneurship to life for MBA students and global executives through the Haas School of Business at UC Berkeley. Mark and co-author John Danner’s excellent book – The Other "F" Word: How Smart Leaders, Teams, and Entrepreneurs Put Failure to Work – is billed as a “…pragmatic guide to exploring the frontier of failure, and improving performance,” and is well worth reading. As valuable as their book is for all business leaders, it’s worth a special look for customer experience professionals. Because every interaction that fails to meet customer expectations is, in many ways, a failure. Long-term customer experience success means the ability to consistently identify and learn from these failures, and do so in ways that help inform, and drive, an organizational culture of transparency, learning and innovation. For their book, Coopersmith and Danner interviewed hundreds of executives and organizations to capture, analyze and learn from their experiences, as well as their perceptions and suggestions about failure. As a result, they identified clear patterns showing how organizations failed. More importantly, they also found out how those that survived (and even thrived on) failures were successful at doing so. A proven framework for transforming failure into increased innovation, greater employee engagement, and accelerated growth. Respect and anticipate failure in order to reduce fear of it. Rehearse to improve your reflexes when various failures happen, either unintentionally or by invitation. Recognize failure’s signals earlier to buy time for more effective responses. React quickly to minimize damage and accelerate recovery. Reflect to draw candid insights into the why and how involved, rather than the who. Rebound to get back into action with newfound knowledge. Remember the insights from this whole cycle, to strengthen employee confidence, workplace culture and organizational resilience. It’s time to begin the process of learning from your failures. We get it. Failure isn’t fun: when valuable customers are unhappy; or if the people, data, processes and technologies that help you design and deliver those experiences don’t work as well as they should; or the myriad other ways that things can go wrong. The good news is that an opportunity to learn from failure is almost always right around the corner. “Begin talking about failure.” The rich Voice-of-the-Customer (VoC) most customer-centric organizations gather is rife with stories of things not going as hoped or planned. You can lead reviews of this data in non-judgmental ways, and encourage open dialogues that look for answers (not blame). “Treat your business like a scientist.” At the core of most customer experience teams is the ability to understand why things do and don’t work, and the ability to use data and analytics to help inform this understanding. You have the tools and the ability. 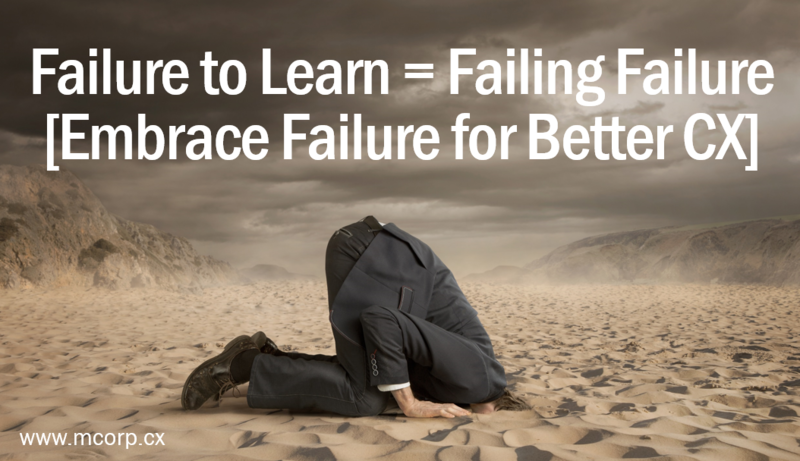 Now’s the time to start focusing those skills on learning from failure as well. “Focus on the What, How, and Why before the Who.” Organizational culture is a funny thing. Planned or not, it exists. When it comes to failure – and the ability to improve customer experience – that culture needs to focus on problem identification and solutions, rather than a ‘need’ to ascribe responsibility. “Don't Waste A Good Failure.” As we’ve all heard, the greatest thing to fear is often fear itself. This holds true here as well; fear of failure is likely the biggest obstacle you’ll have to overcome. But now, you have access to some tools you can use to help you and your organization begin to reduce the fear of failure by building trust and support along with accountability.